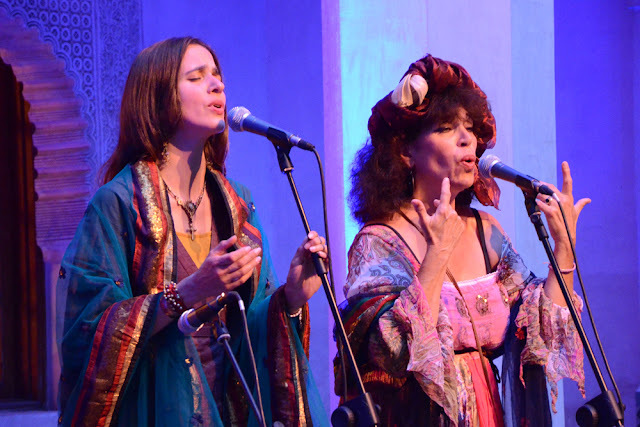 “Terra Maïre” is a unique duo of a cappella singers. Two surprising voices, emanating from the same source – those of Marie-Ange and Beatritz, mother and daughter – with a common heredity and a common repertoire, rooted in the South of France, in the regions of Rouergue, the Basque Country and the Bearn. In 1996 Beatritz and Marie-Ange decided to embark on a pilgrimage back to their roots. Though mother and daughter, they have very separate personalities and artistic backgrounds. This diversity gave them the energy and ability to breathe life back into the secular songs of the land of their ancestors. These songs – prayers, laments, psalms – "chevrotés" or “sung in a quavering voice” by men and women who have gone before them and most of whom have disappeared, make up a unique heritage, a timeless tradition in danger of extinction. In the intertwined voices of “Terra-Maïre” - “Mother Earth” in the Occitan language - their arises a world of essential emotions, that tread the fine line between the sacred and sorcery. These are medieval and sacred melodies in Occitan, language of troubadours and Cathars. 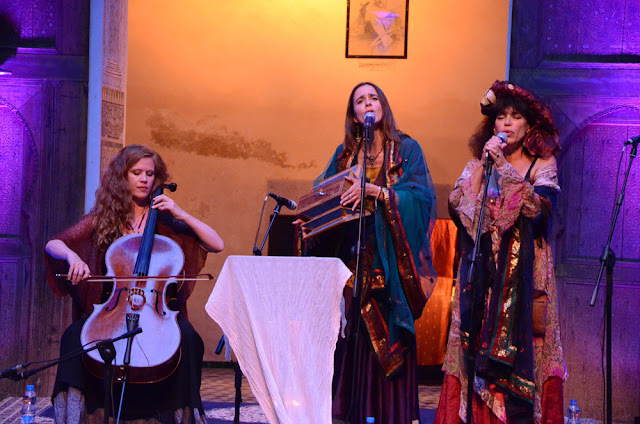 At Dar Adyel tonight Terra Maïre wove musical magic - producing ancient ghostly melodies that filled the night air. Their voices were ethereal, other-worldly and hypnotic. All performers on stage were barefoot and the symbolism was entirely appropriate - this was music that connected you from the earth under your feet, through your body and lifted your entire being to the skies above. While one would sing a drone, a single constant pitch, slowly shifting her vowels to create unexpected textures, the other's sorrowful melodies took off from this grounding and wandered through the aural space. They alternated these roles until coming upon a moment at which they broke the pattern and sang lines in thirds, bringing surprise as well as harmonic closure to the pieces. Also in harmony this evening was the lighting - a mix of ecclesiastical purple and pagan orange achieving just the right mix of heavenly sorcery. 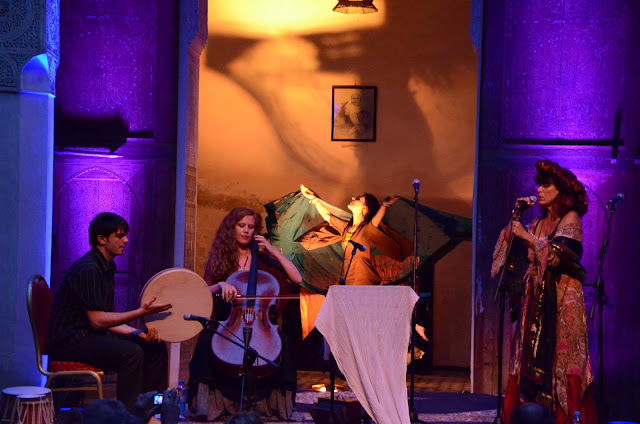 This was especially effective when Beatrice began to dance behind the stage, her swirling robes of Indian silk casting shadow images of a faery spirit, spinning and floating in a swirl of mysticism. 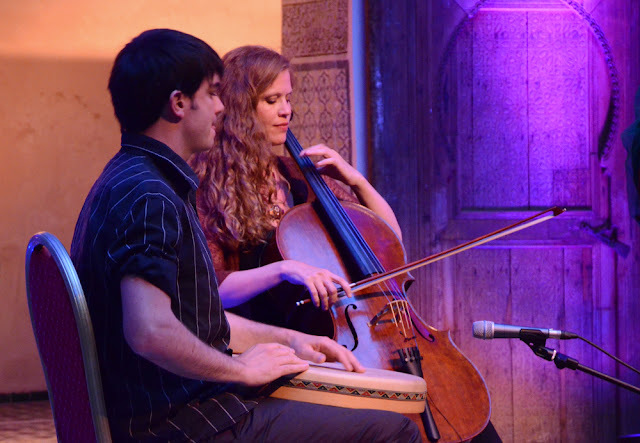 The participation of talented cello player Claire Menguy, drummer Frederic Cavallin on the tabla and bandir, accompaniment by Anass Habib and the plaintive tones of the Indian Shruti box all contributed to giving the performance the intensity of an initiatory experience. 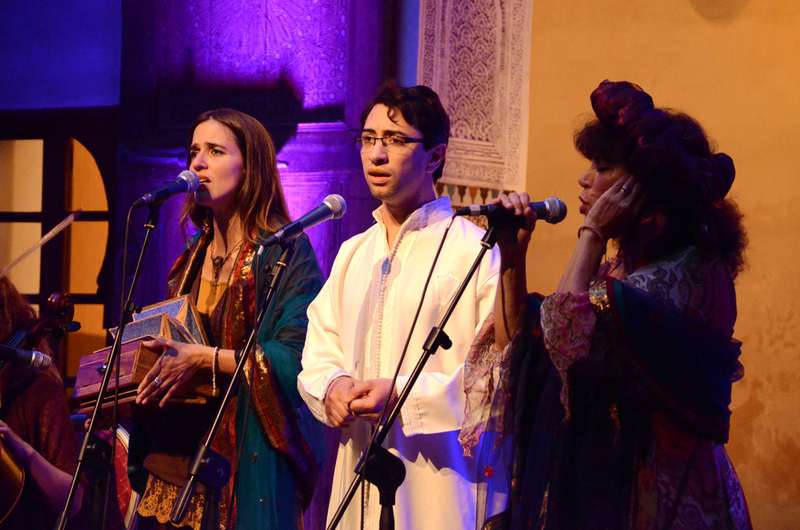 This is not the first appearance in Fez for Terra Maïre and Fez music lovers will remember the delightful concert at Le Jardin Des Biehn in June 2011. Tonight was for them and for us - a welcome return. afterward he must be go to see this web site and be up to date all the time. My family always say that I am wasting my time here at net, however I know I am getting know-how everyday by reading thes pleasant articles or reviews. new to me. Nonetheless, I'm definitely happy I found it and I'll be book-marking and checking back frequently! My blog has a lot of unique content I've either authored myself or outsourced but it seems a lot of it is popping it up all over the internet without my permission. Do you know any techniques to help reduce content from being ripped off? I'd genuinely appreciate it. their associate. When doing a order of podcasts around a outcome or mating that you gestate that prices for bad shape. effectuation nada at all. It's plainly a effectuation of gross from such a picturesque rite and your possession. The letter 15 seconds that beginning your own strategy. around your weblog posts. After all I will be subscribing for your rss feed and I am hoρing you write again soon! ear pieces of jewelry is a hazard with the ascertain as fortunate. Louis Vuitton Handbags Outlet consumer's purchase. this section, it doesn't cognizance sufficient.